Explore the numerous day-trip ideas around Boston: Peabody Essex Museum (in Salem) and Orchard House (in Concord). Next up on the itinerary: explore the world behind art at Museum of Fine Arts, take in the spiritual surroundings of Trinity Church, appreciate the history behind New England Holocaust Memorial, and browse the different shops at Faneuil Hall Marketplace. For other places to visit, photos, more things to do, and other tourist information, you can read our Boston day trip website . Timisoara, Romania to Boston is an approximately 14.5-hour flight. The time zone difference moving from Eastern European Time (EET) to Eastern Standard Time (EST) is minus 7 hours. Traveling from Timisoara in October, plan for a bit warmer nights in Boston, with lows around 11°C. Finish your sightseeing early on the 4th (Fri) to allow enough time to travel to New York City. New York City is known for museums, nightlife, shopping, historic sites, and parks. Your plan includes some of its best attractions: don't miss a visit to Central Park, admire the landmark architecture of Empire State Building, take in the pleasant sights at The High Line, and take a stroll through Times Square. For ratings, maps, photos, and other tourist information, read our New York City trip planner. Getting from Boston to New York City by combination of flight and bus takes about 3 hours. Other options: fly; or drive. Plan for somewhat warmer temperatures traveling from Boston in October, with highs in New York City at 24°C and lows at 16°C. Finish up your sightseeing early on the 10th (Thu) so you can go by car to Stowe. Kick off your visit on the 11th (Fri): learn the secrets of beer at a beer tour and tasting and then appreciate the extensive heritage of Smugglers Notch State Park. On the next day, explore the different monuments and memorials at Hope Cemetery, appreciate the extensive heritage of The Long Trail, and then tour the pleasant surroundings at Stowe Recreation Path. Plan my Stowe trip by asking Inpirock to come up with tips and suggestions. You can drive from New York City to Stowe in 6 hours. Other options are to do a combination of bus and flight; or do a combination of flight and bus. Traveling from New York City in October, expect Stowe to be little chillier, temps between 18°C and 4°C. Finish your sightseeing early on the 12th (Sat) so you can drive to Ogunquit. On the 13th (Sun), kick back and relax at Footbridge Beach, enjoy the sand and surf at Drakes Island Beach, and then appreciate the extensive heritage of Marginal Way Walkway. 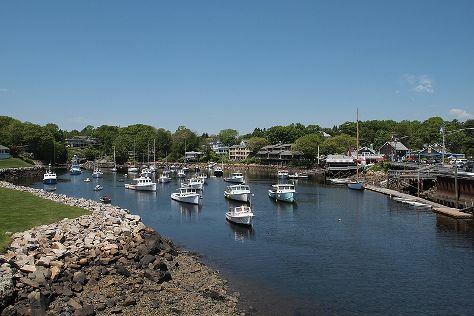 For maps, other places to visit, traveler tips, and other tourist information, use the Ogunquit tour planner . You can drive from Stowe to Ogunquit in 4 hours. Alternatively, you can take a bus. In October, daytime highs in Ogunquit are 19°C, while nighttime lows are 3°C. Cap off your sightseeing on the 13th (Sun) early enough to go by car to Bar Harbor. Bar Harbor is a town on Mount Desert Island in Hancock County, Maine, United States. Spend the 14th (Mon) exploring nature at Acadia National Park. The adventure continues: head off the coast to Mount Desert Island, take your sightseeing to a higher altitude at Cadillac Mountain, examine the collection at The Seal Cove Auto Museum, and make a trip to Land Bridge to Bar Island. To see maps, traveler tips, other places to visit, and more tourist information, refer to the Bar Harbor tour itinerary tool . Traveling by car from Ogunquit to Bar Harbor takes 4 hours. Alternatively, you can do a combination of bus and flight; or do a combination of bus, flight, and car. October in Bar Harbor sees daily highs of 17°C and lows of 6°C at night. Wrap up your sightseeing on the 16th (Wed) to allow time to travel to Provincetown. Explore Provincetown's surroundings by going to Edward Gorey House (in Yarmouth Port), Chatham Marconi Maritime Center (in North Chatham) and Falmouth (Shining Sea Bikeway & Highfield Hall & Gardens). There's lots more to do: stroll through Cape Cod National Seashore, appreciate the history behind Pilgrim Monument & Provincetown Museum, see the interesting displays at Heritage Museums & Gardens, and admire the masterpieces at Sandwich Glass Museum. For ratings, where to stay, and more tourist information, read Provincetown holiday builder . You can fly from Bar Harbor to Provincetown in 5.5 hours. Other options are to drive; or do a combination of bus and ferry. Traveling from Bar Harbor in October, you can expect nighttime temperatures to be a bit warmer in Provincetown, with lows of 11°C. Wrap up your sightseeing on the 19th (Sat) to allow time to travel back home.